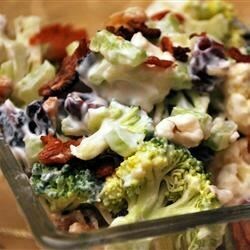 "This is a flavorful and crunchy vegetable salad tossed with peanuts and bacon bits." Place bacon in a large deep skillet. Cook over medium-high heat until evenly brown, 10 to 15 minutes. Drain bacon on a paper towel-lined plate; crumble. Mix broccoli, cauliflower, celery, peas, and cranberries in a large bowl. Whisk mayonnaise, Parmesan cheese, sugar, onion, vinegar, and salt together in a bowl. Pour dressing over the salad; add nuts and bacon and toss well. YUM!! This is so good. I did substitue dried cherries for the cranberries, and almonds for the peanuts, but followed the rest. So good. Thanks Pamela for a new potluck dish. This is a great salad. I have been making it for about four years. Everyone always asks for the recipe. A great way to get you kids to eat their vegetables. Made this salad for my finicky sisters,they raved about it! The cranberries are a nice touch. Awesome! I was amazed that my picky family all asked for seconds. I don't care for the salad leftover, but it's easy to customize the portions.